The USS Bowfin Submarine Museum is expected to play a crucial role in recording the resting place of one of the Navy's most famous World War II submarines, the USS Wahoo. The Wahoo, skippered by Cmdr. Dudley "Mush" Morton, was lost in Russian waters just north of Hokkaido, the northernmost Japanese island, in 1943. The Associated Press reported yesterday that the Russian news agency ITAR-Tass said Russian divers spotted the wreckage in the La Perouse Strait and took pictures. The divers were from the Far Eastern State Technological University of Vladivostok. It was the third confirmation during the last three months of three of 52 submarines lost in World War II. The Boston Globe reported yesterday that a private Seattle ocean survey company believes it has found the wreck of the USS Grunion, which disappeared in July 1942 on its maiden voyage near the Aleutian Islands. In May, Navy divers confirmed the location of the USS Lagarto, believed to have been sunk by a Japanese minelayer 61 years ago in the Gulf of Thailand. Lt. Cmdr. Jeff Davis, Pacific Fleet Submarine Forces spokesman, said yesterday that the Navy is aware of the efforts of the Russians and a Boston family in trying to confirm the locations of the Wahoo and Grunion. "We know what is going on," Davis said, "and we're always interested in honoring the legacy of the people who have died making a sacrifice to their country." In the case of the Wahoo, Charles Hinman, educational director for the Bowfin Submarine Museum, said Morton's grandnephew Bryan McKinnon approached his organization earlier this year and asked if it was willing to be a repository for materials gathered during the search. McKinnon, who now lives in Tokyo and has spent the past decade trying to pinpoint the location of the Wahoo, told the Russians where he believed the submarine was lost. Hinman emphasized that by law no one is allowed to take any artifacts or relics from any sunken Navy vessel. "It is considered a war grave site," he said. "It's not to be disturbed." Instead, McKinnon's "Wahoo Project" wants the Bowfin Museum to store "all materials used in the search, ranging from photographs to drawings and video recordings." Hinman said the ocean is about 200 feet deep in the area where the Wahoo is believed have been lost. "It is in an area where the current is fairly strong," he said. Generally, the best time for any type of search will probably be next summer, he said. The Navy has said the Wahoo first stopped at Midway Island and entered the Sea of Japan via La Perouse Strait about Sept. 20, 1943, and patrolled below the 43rd Parallel for about four weeks. Wahoo was able to sink four ships in the area. 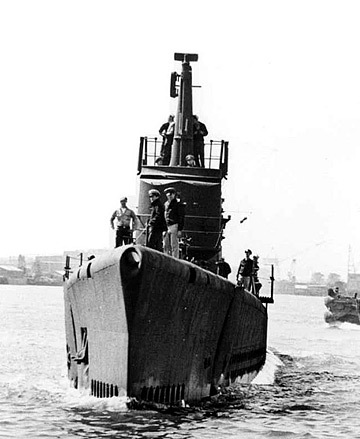 The Wahoo, a Gato-class diesel submarine, was officially listed as missing on Nov. 9, 1943. It was believed to have been sunk on Oct. 11 with 79 crew members still on board. A plaque honoring the Wahoo, which sunk 19 Japanese ships, was erected at the Bowfin museum adjacent to the USS Arizona Memorial shortly after the museum was established in 1991.